Today at the Everything Easter Egg-strvaganza we have 1/2 Dozen Simple and Fun tradition ideas for you along with a GREAT giveaway from Nintendo. This is a new tradition we started in the Novotny home last Easter. I purchased some fun plastic eggs and treats to go inside of the eggs, and my two youngest and I filled the eggs and placed them in a Easter basket. 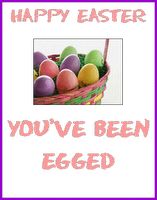 Once it was dark outside we headed to two of our neighbors homes, we then placed a sign on the door that said “Happy Easter You’ve been Egged” We left the basket of filled eggs on the doormat, rang the bell and ran like crazy so that we would not be seen. You remember the days of door bell ditch. Childhood memories in the making. My kids love this new tradition and are looking forward to Egging a few homes this week. One of my many MOMMY goals has been to teach my children the habit of giving. As you are fully aware we are living in an “all about ME” society, where our children are more influenced to think about themselves and what they can have and get then what they can give or do for others. One way I am teaching/modeling the giving habit to my youngest boys is by having them create simple holiday gifts to give to their classmates throughout the school year. 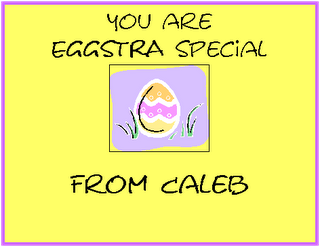 Last Easter we came up with this SIMPLE “You are EGGSTRA Special” gift. We created a business size card that says “You are EGGSTRA Special”, then punched a hole on the corner of it so that we could tie a piece of ribbon on it. Next we filled plastic eggs with treats and before we closed the egg we put part of the ribbon in the egg so that the Tag would dangle from egg by the ribbon. Not only did my boys have fun making these simple gifts, they also felt the joy of giving when they got to hand each one of their classmates a simple gift from them. Do you have a fun and simple giving idea? Post a comment and share your ideas with the 24/7 MOMS. Make a Easter Bunny foot print stencil -and leave a trail around the house by pouring carpet fresh on your Bunny Foot stencil, to appear as if the Bunny left his foot prints all over your house. You can als0 get a little bit of white fur to leave somewhere as if the Easter bunny got his tail caught on something! At end of trial you can leave eggs or something or just make it look like the bunny was checking in on them while they slept. Each year write a note to your child/children from the Easter bunny place it in an egg that they find during their Egg hunt. You can include funny stories about your children in this letter, things you as the Easter Bunny know about them etc. Make it personal. Leave a trail of candy kisses that guide your child to their Easter basket . Be sure they don’t eat them along the trail or you just might have a sugar overloaded kid before they even find their Basket. Purchase chocolate bunnies in a box and set them up like bowling pins. Use a ball that is soft and allow your kids to Bunny Bowl. Are your techno kids DS junkies? My two youngest boys have just about become professional DS’ers, especially while driving on long trip sin the car. Nintendo has a Brand new game out for the DS and I am sure your Littlest Pet Shop fan will go crazy if this arrived in their Easter Basket this year. Spring fever has arrived early with LITTLEST PET SHOP Spring for the Nintendo DS™! Set to expand the critically-acclaimed LITTLEST PET SHOP digital collection and inspired by the Hasbro, Inc. blockbuster toy line, LITTLEST PET SHOP Spring will feature a festive and colorful spring environment for girls to explore alongside their favorite sidekicks, including six new, exclusive pets. The fun also gets turned up with all-new playsets as well as four new mini-games for a total of 20 including those from previous Nintendo DS versions. Accessory choices will also expand allowing pets to step into spring in high style. With the addition of 20 new accessories, girls will be able to select from well over 100 hats, glasses, scarves and other fun items. 24/7 MOMS and Nintendo DS™ are giving away 1 LITTLEST PET SHOP Spring for the Nintendo DS . To enter for your chance to win, enter your name and email address in the box below you will be signed up for today’s giveaway as well as be added to the 24/7 MOMS E-list (if you are not already a 24/7 MOMS subscriber).